"Dad, that information is all wrong! Maggie's a baby, not my best friend. You don't know anything about me!" "The Dad Who Knew Too Little" is the eighth episode of Season 14, which aired on January 12, 2003. The episode was written by Matt Selman and directed by Mark Kirkland. Elliott Gould guest starred as himself. The episode received mixed reviews from TV critics. "Lisa becomes angry after watching a horribly inaccurate video that Homer gave to her as a birthday gift. The video showcases Homer's complete lack of knowledge regarding his daughter, so he decides to hire a private detective to learn more about Lisa." Bart and Lisa are watching a TV program, "Padz" (a parody of MTV Cribs). They see a commercial for a new kind of personal diary, which does not allow anyone else to read it and shocks them if they try. Lisa, tired of Bart reading her diary (which he is doing at that moment and agrees with her), asks Homer and Marge to get her the diary for her birthday, to which they agree. The next day, Homer and Bart go to the mall to get the diary for Lisa. Homer gets sidetracked when he sees that the food court is handing out free samples. Bart tells him that they have to get Lisa's gift, but Homer ignores him and pigs out on all the free food (and when that runs out, he starts chewing up some pants in the men's department). Afterwards, they finally go to the toy store to get the diary for Lisa. However, all copies of the diary are sold out (the last one was bought by Mr. Burns minutes ago, to make a list of his enemies). Clueless about what to get for Lisa, Homer roams about the mall, until he encounters Ned Flanders, who informs him that he can make a personalized movie about Lisa, just like the one Flanders made for Rod. Homer, short of ideas, decides to go for Ned's idea (with the humorous quote "Stupid Flanders, you're a genius!"). On Lisa's birthday, Bart gives her a laser pointer and demonstrates its power by flashing it at Principal Skinner's crotch, prompting him to examine closely what that "red dot" is. Homer gives Lisa her present — the personalized movie he made for her. She is disappointed that she didn't get the diary she wanted, nevertheless she watches the movie. It's a story about Lisa as a sheriff in a Western movie. The dialogue in the movie helps Lisa realize that Homer knows absolutely nothing about her. She runs upstairs crying, making Homer feel bad. The next day, he tries to make it up to her by asking her about herself, but she disowns him, saying that he had eight years to get to know her and now it's too late. Later that day, feeling dejected, he goes to Moe's. When he tells the barflies there his problem, Moe tells him to have Lisa followed by a private detective and gives him a card for one, Dexter Colt. That night, Homer goes to a rather seedy part of town to meet Dexter. He wants Colt to follow Lisa and find out as much as he can, so that he can at least act as the perfect father. The shady detective takes the case. Dexter starts following Lisa and going through her locker. He even muscles Skinner into showing him Lisa's permanent record. He blackmails Nelson to get him a book report of "The Secret Garden," written by Lisa. Finally, one day, as Homer leaves the power plant, he sees a large envelope on his car hood. It's the report by the detective about Lisa. Using the report, he starts to bond with Lisa by playing the songs that she likes and going to a protest against animal testing at a research lab, where monkeys are made to smoke cigarettes and pigs are smothered with make-up. Later that night, Homer tucks her into bed, happy that he's getting to know her, although he almost lets slip about the report. Homer goes to see Dexter Colt to thank him for all his work. When Colt gives him a bill for $1000 (which includes many unrelated costs, such as a $40 steak that would have been free if he had eaten the whole steak and silver bullets to kill Lisa if she was a werewolf). Homer refuses to pay the incredible amount. Colt pulls out his handgun and grabs Homer by his shirt, but Homer wriggles out of his shirt and jumps out of the window. Colt swears revenge as Homer runs off into the night. The next morning, Lisa, Homer, and Bart are watching the news. They see that someone has vandalised the research lab and stolen all the animals. Chief Wiggum says that, based on the clues collected (such as a Malibu Stacy scrunchy, a saxophone reed and the book report for "The Secret Garden" by Lisa Simpson), Lisa Simpson is the main suspect. Lisa says she is innocent and Homer knows she has been framed by Dexter Colt. The cops come to arrest Lisa, but Homer and Lisa take off in the car, with the cops in pursuit. Finally, they manage to escape and disguise themselves with shoe polish (to color their hair). They check into a motel and call Marge, but the cops have tapped the phone and zero in on their location. Homer, meanwhile, tells Lisa the truth about the detective and she gets angry with him again. When the cops arrive, Homer and Lisa escape through the window. After running for a while, they come across a circus, where they see the stolen animals from the research lab. They are about to call the cops, when Dexter Colt shows up, aiming a cannon (with a human cannonball inside) at them. He fires it and Homer pushes Lisa out of the way and gets hit by the human cannonball, but he's okay (a reference to the episode Homerpalooza). Colt pulls out his handgun and Homer takes off into a hall of mirrors. 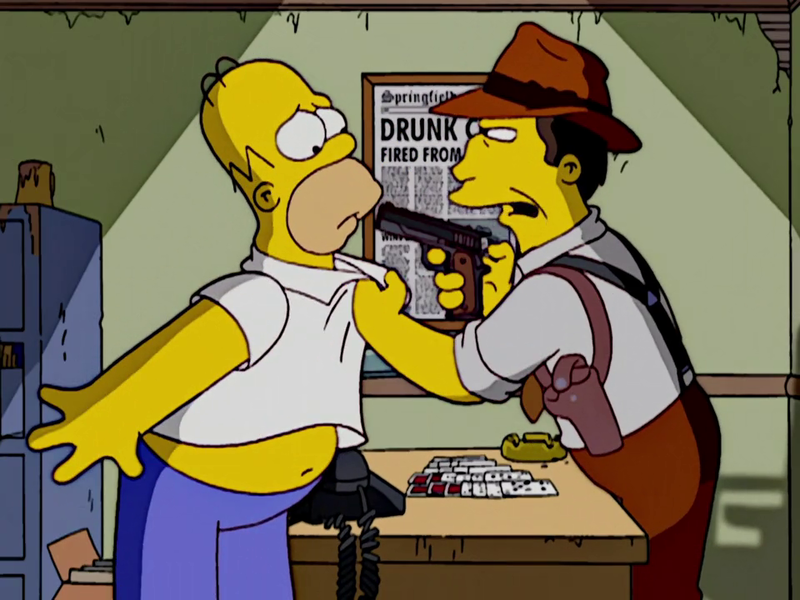 Many reflections of Homer show up, but Colt shoots Homer in the arm. As Colt is about to shoot Homer, Lisa shows up. Colt wonders how she heard them, and Homer says that Lisa's hearing is very good and that one day when she was very young, she had heard him quietly sobbing in the closet. Lisa, impressed that Homer actually remembered something about her, flashes Colt in the eye with the laser pointer that Bart gave her (incidentally blinding him). Later, Colt is arrested and Lisa is exonerated. Homer tells her that he released all the lab animals into the wild. We see that he gave them to the Spuckler family, and Brandine Del Roy is suspicious of Cletus' intentions with the pigs. During the closing credits, we see that Lisa finally got her diary. When she goes to sleep, Bart sneaks in steals the diary using a pair of tongs. While the house was shown, we hear Bart walking to Homer and asking him to read him a bedtime story. Homer accepts and asks Bart to give him the diary. He opens it and gets electrocuted as a result of being an unauthorized user. The episode ends with Bart laughing at his gullible father's excruciating pain and misery. Modified on July 15, 2017, at 07:10.